Of course, Jim is my archetypal obsessively passionate collector--gathering up curious old things since childhood and studying them all in depth. The "hunter" to my cautious "protector." But wait. I wasn't a born collector, but at the age of 42 I was bitten hard by the bead-collecting bug. 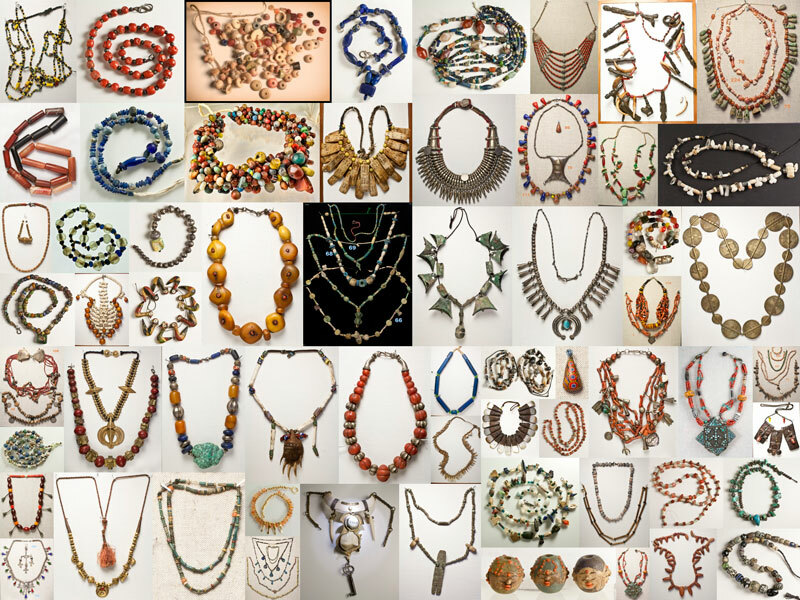 I am surrounded by boxes and boxes of ancient to merely antique strands of beads as proof that I too can lose my head in the pursuit of passion. 1. A nugget of curiosity, a pinch of learning. Who doesn't love a strand of beads? After girlish infatuations with pop beads and love beads (see Tribe of the Breakaway Beads), the first ones to really spark a craving and a curiosity was a strand of Murano (Venetian) glass millefiore beads that I bought in a department store in the 1970s (photo below). I was fascinated by how different each one was. I bought a second strand from a museum-shop catalog. The string of the first strand broke, but I still have them all. Once I discovered the ancient and complex process behind them, I treasured them even more. So... openness and curiosity come first. 2. The "moment of aesthetic arrest. "** The eyes are dazzled and tell the brain to shut up. It's love at first sight. "You're the one I've been waiting for." This beautiful thing is calling your name. You are seized by its authenticity, its power. The artisan who made it is sending you a message in a bottle, conveyed by a sea of loving hands over time and across cultures. It will share its power with you, whether that power is about elevating your status, healing your restless heart, or lending you enough mojo to get you through another day at your miserable job. If it were a person, you'd be plotting a rendezvous. 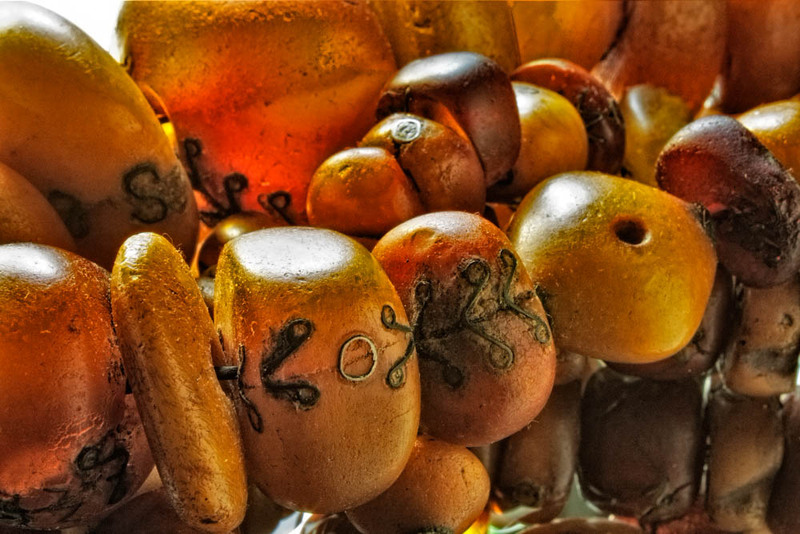 This purchase kicked off a positive feedback loop: the more I experienced handling beads, the more I wanted to learn about them; the more I learned, the more in love with them I became. And this love is not the chaste love of seeing artifacts in a museum or the abstract love of history and culture. It's not the calculated "arranged marriage" of the art investor. It's not the slambam faux-love of the shopaholic who compulsively accumulates artifacts she has no authentic connection to. No, for the true collector, this is amor--this is enchantment, this is romance. For the collector, this seizure, this moment happens again and again, but certainly not with every purchase. In a field as plentiful as beads, there are many "good buys"--a little magic for a sensible price--all part of "filling out the collection," all part of the hunt. Each "catch" teaches you a little more about the game. But, like fishing or hunting, there is always that "big one" hiding in the shadows, tempting you to go a little farther into the dark forest, a little farther into the deep waters. It is amor, but also marriage--a commitment that requires organization and thoughtfulness. PHOTO, top. 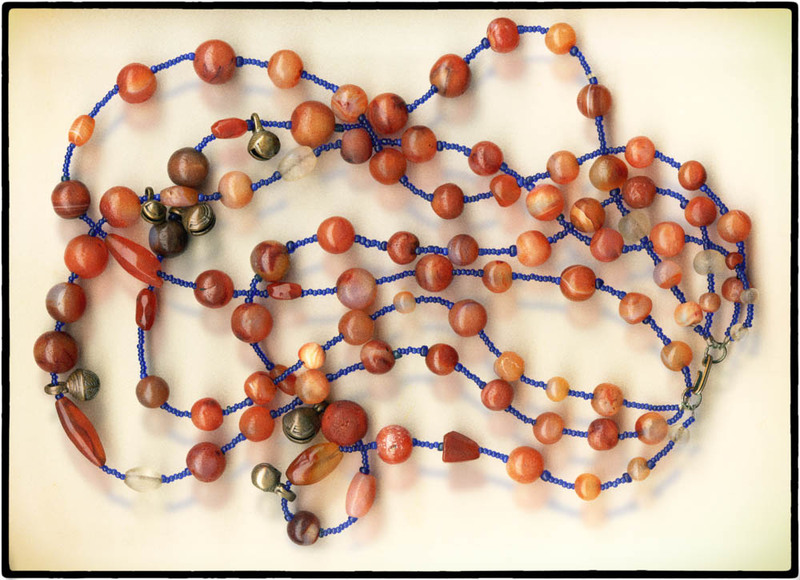 A sampling of beads from the collection. * A more sensitive portrayal is found in the family memoir "Hare with Amber Eyes" by Edmund de Waal. ** "Moment of aesthetic arrest" is a Joseph Campbell phrase, describing the seizure of romantic love outside the prescribed rituals of sacraments and arranged marriages.